Forty years of punk: Jon Savage, Thurston Moore and Don Letts look back. Plus Ways of Seeing: a major focus on the changing shape of cinema distribution; Athina Rachel Tsangari on Chevalier, Chet Baker biopic Born to Be Blue, and the S&S Interview with D.A. Pennebaker and Chris Hegedus. 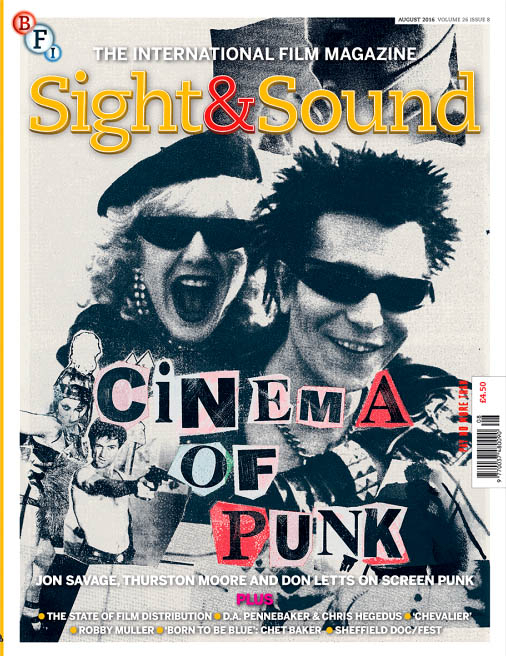 Strange times call for special features, and our August issue packs two into one with major surveys of both the screen legacy of punk at 40 and the major changes technology is having on the way we watch movies. First, across 12 pages, we have Jon Savage perusing that shock of the nihilistic new that hit decadent liberal pieties and commercialised hippie culture as Taxi Driver and the Ramones’ first album emerged almost back to back in early 1976. Thurston Moore takes us back to punk-era film culture with Amos Poe and the sleaze cinema of 42nd Street, while Don Letts recalls the scene in London, Alex Cox reflects on the cult legacy of Sid and Nancy, Will Fowler describes punk’s impact on a legion of British DIY filmmakers and Frances Morgan follows the trail to the early 90s riot grrrl scene. Then, across 11 pages, we explore the changing shape of cinema distribution and its knock-on effects for distributors, exhibitors – and of course audiences. Industry expert Geoffrey Macnab sets the scene and takes counsel on the current struggles of arthouse exhibition. Amanda Randall heads off the beaten track to discover the new lease of energy amongst noncommercial community cinemas; Nick Pinkerton calls for critical debate and discourse to catch up with the new forms of screen art, while Kate Taylor investigates the fightback from cinephile activists who aren’t rolling over in the face of commerce and technology.